PapayaMobile’s global programmatic mobile ad platform AppFlood has released its third quarterly data report on Global Mobile Android Advertising Insights, which analyzed global mobile traffic, cost-per-user, mobile ad spending and more from the AppFlood network. This quarter’s report found that Asia, the Middle East and Latin America are leading the pack with the highest number of global users downloading mobile apps after discovering them through ads. Install rates in the Middle East and Latin America have nearly tripled, with the Middle East accounting for 5.86 percent of mobile installs and Latin America accounting for 9.38 percent of installs. Overall mobile traffic has grown 99.4 percent, quarter-over-quarter, since Q3 2013, with a 163 percent gain between Q2 2014 and Q3 2014 alone. The cost of a single install has fallen to $0.26 (down from $0.43 one year ago), but overall global mobile ad spending has grown by 116.5 percent, quarter-over-quarter, since Q3 2013. 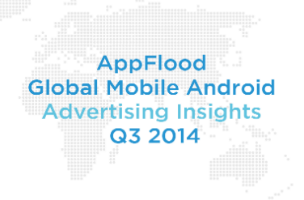 Ad spend on the AppFlood network grew 251 percent from Q2 2014, which AppFlood says is due to Chinese advertiser demand. Overall, the report found that 66 percent of the global mobile ad budget is now spent on acquiring users from Asia, the Middle East and Latin America, and that 67 percent of mobile users acquired from around the world are from those three regions. All told, personalization apps and action games topped the list of highest-earning apps and games, respectively, for the app store. PapayaMobile launched AppFlood in July 2012, and was serving 200 million impressions per month just a few months later. The company’s SmartConvert technology utilizes algorithms to optimize user acquisition campaigns. Using machine-learning technology, the AppFlood platform predicts which users are most likely to convert. The company’s full Q3 insights are available on its website.